An easy but exciting loop for those that enjoy climbing or descending over long flat trails. Trail Description: (uphill one-way from parking lot) From Trailhead #1, head south and cross over the Bragg Creek Bridge. At the four way intersection turn right westbound. A couple hundred meters further, take the trail veering off to the right and up a steep hill. At the top of the hill continue straight past the Cyrstal Line shortcut on your right. Follow this trail until it comes to a T intersection with Crystal Line (photo #2). Turn right and head westbound for a few meters before rejoining Loggers Loop on your left (photo #3). Continue the steep climb (makes an excellent descent) and pass through a number of young pine forests (photo #1), aspen stands and across a bridge (photo #5). A few more up and downs and you'll merge with Sundog Loop. 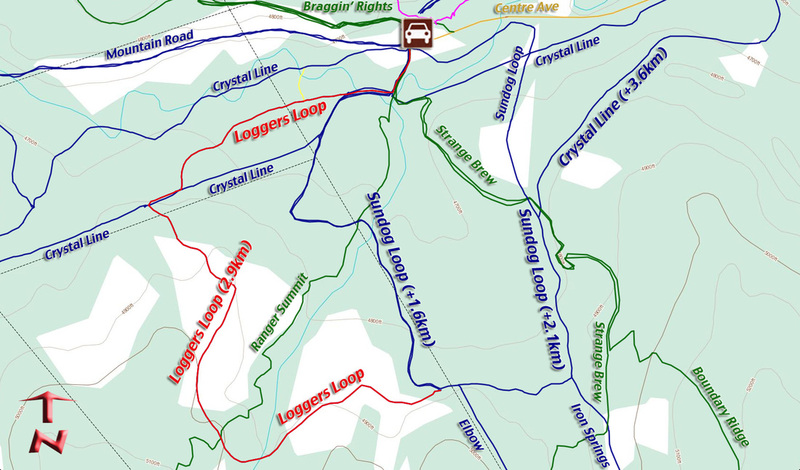 Either turn left and head (1.6km) down Sundog Loop to the parking lot (another great descent) or continue east towards the longer section (2.1km) of Sundog Loop, or Crystal Line East (3.6km) back to the parking lot. Although this route description is describing the counter clockwise version of Loggers Loop, the clockwise versions are just as or more exciting.